Enable the NodeSync Service for OpsCenter Monitoring. Designate which keyspaces and tables have NodeSync active for viewing NodeSync status. The NodeSync Service itself is on by default in DSE versions 6.0 and later; however, keyspaces and their tables must be explicitly opted in. Follow the steps in this procedure to quickly turn on NodeSync monitoring for eligible entire keyspaces or specific tables. 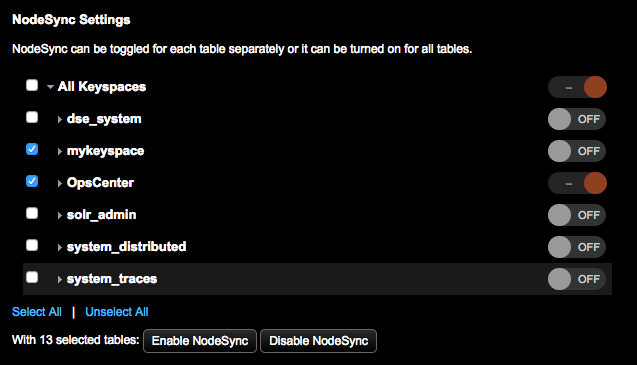 Note: NodeSync can also be enabled for tables using DSE nodesync enable. NodeSync can also be enabled for an existing table using CQL and setting nodesync in table options. Important: The nodetool repair command fails to run on Nodesync-enabled tables. Tables with NodeSync enabled are skipped for nodetool repair operations run against all or specific keyspaces. NodeSync is enabled in DSE by default. If applicable (NodeSync was disabled), enable the NodeSync Service. See nodetool nodesyncservice enable. 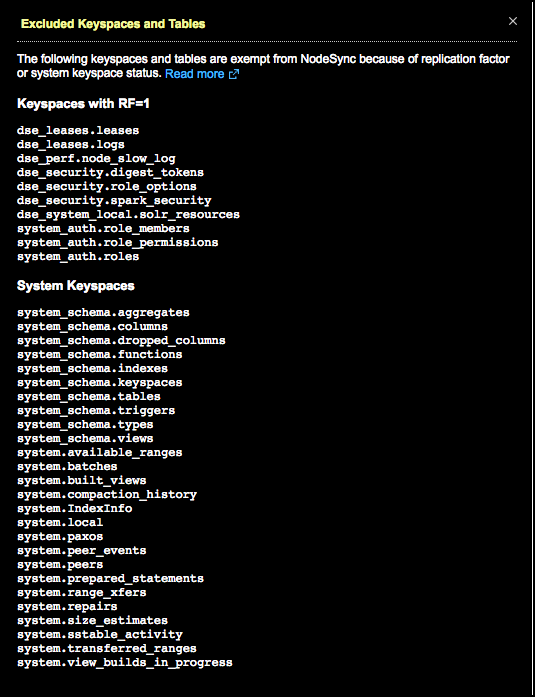 Empty keyspaces cannot be selected for monitoring NodeSync in OpsCenter. Create tables for keyspaces you intend to monitor. If OpsCenter authentication is enabled, be sure to set user permissions for the NodeSync Service for the applicable user roles and clusters. Click the Details link for the NodeSync Service. The NodeSync Service links (Details or Configure) are only available for DSE versions 6.0 and later. The Configure link only appears if the Status column indicates the NodeSync Service is Off. The Configure link is only available if the cluster is DSE version 6.0 or later. Click Configure when NodeSync is actively available and keyspaces and tables have not been enabled yet for monitoring. Click Details when NodeSync has already been configured but changes are required for enabled or disabled keyspaces and tables. Click the On or Off toggle buttons. Clicking an On button causes the service to send an ALTER table statement that is effective immediately; no DSE restart is necessary. The number of tables queued for toggling NodeSync status is displayed. Select the check boxes for the keyspaces and tables. Click the Select All | Unselect All links for convenience. Click Enable NodeSync or Disable NodeSync. As keyspaces or tables are selected for enabling or disabling NodeSync, the number of tables selected is specified. The default maximum per request is 50 tables. Note: If you encounter schema agreement errors when enabling or disabling multiple tables, increase the value for the max_request_tables option. Tip: NodeSync Settings shows keyspaces and tables that are eligible for NodeSync. Some tables are not shown and are exempt from NodeSync because their keyspace has a replication factor of 1 or is a reserved system keyspace. Click the View excluded tables link to view the excluded keyspaces and tables.